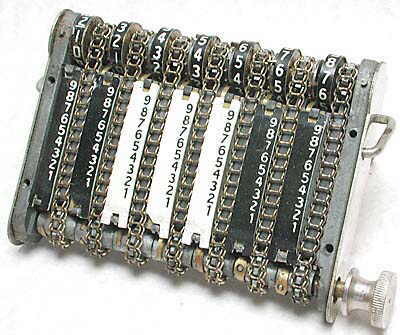 Can perform addition only, this model has 7 chains and can add up to 9,999,999. The stylus is inserted in the chain at the digit required to be added and the chain is moved downwards to the edge of the frame. The knob at bottom right is rotated to clear the register back to zero. 123 x 79 x 26 mm (4.8" x 3.1" x 1.0"). 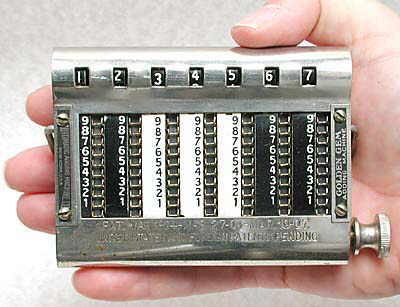 Made by the Automatic Adding Machine Co., New York, U.S.A. 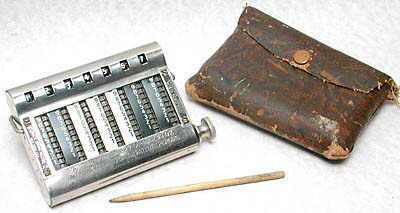 Carries patent dates from 1904 to 1907. There are other models, some are painted black, and some have 9 chains. These appear fairly commonly on the internet auctions, so must have been very successful. Golden Gem with its wire stand folded out, wooden stylus, and leatherette case. With cover removed, showing the chain mechanism.